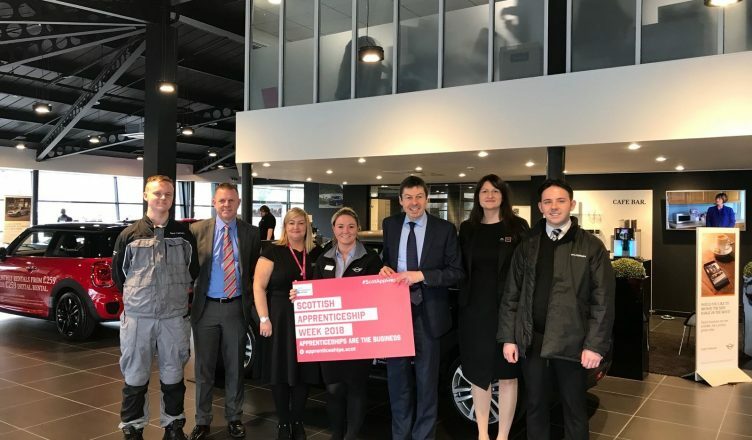 Ken visited Arnold Clark’s Harry Fairbairn MINI branch in Giffnock recently to learn more about their apprenticeship programme and show his support for Scottish Apprenticeship Week 2018. During the visit, Ken was given a tour of the facility and spent some time talking to the branch’s apprentices to find out more about the work they do as they build towards gaining their qualifications. The apprentices are gaining experience across a variety of fields and Ken enjoyed finding out how Parts Apprentice Antonio Gonzalez, Apprentice Technician Christopher Lavelle, and Apprentice Service Advisor Nicole Gallagher are benefitting from the programme. You can find more about Scottish Apprenticeship Week here or for further information about Arnold Clark’s apprenticeship programme, visit their website.